Serial-killer movies have been around for a long time, and they continue to be released because of their contemporary popularity. Whether this stems from a curiosity about the psychology behind these killers or the law enforcement processes for catching them, these movies can easily end up glamorizing the killers unless they are done carefully. The trailer for this upcoming film suggests that this movie seems to lack the depth or angle necessary to eliminate the romanticising of a serial killer. This, paired with Zac Efron’s overt attractiveness, makes for a glamorized Ted Bundy. The fascination with serial-killer movies leads to a deeper issue in our society: the sensationalism of violence. The more violence we see in movies and television, the less it starts to affect us. When we watch something on a screen, we become spectators and tend to be unphased by what we see; we simply sit back and watch for entertainment. We need to be conscious viewers, critical of what we are watching and maintain the sense of empathy and ethical standards that we carry with us in the real world. In this case, we can be mindful of Ted Bundy’s real victims – the over 30 women that Ted Bundy brutally raped and killed – and the kind of person he actually was. He is not a character to lust after, but an example of real-world violence to be wary of. Movies put forth a message or lesson to the public. 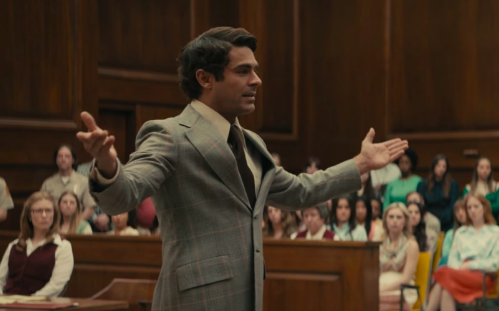 It’s unclear what the creators of Extremely Wicked, Shockingly Evil and Vile had intended, but we can watch it with a critical eye and try to glean a lesson from it. This is what Kathy Kleiner Rubin, survivor of a Ted Bundy attack, said she wanted for the movie in an interview with TMZ. Rubin expressed that, “hopefully [the film] will make women be more aware of their surroundings and be cautious” of tactics used by predators, an important lesson for women everywhere. Freshman Danielle Rice is a Layout Assistant. Her email is drice1@fandm.edu.